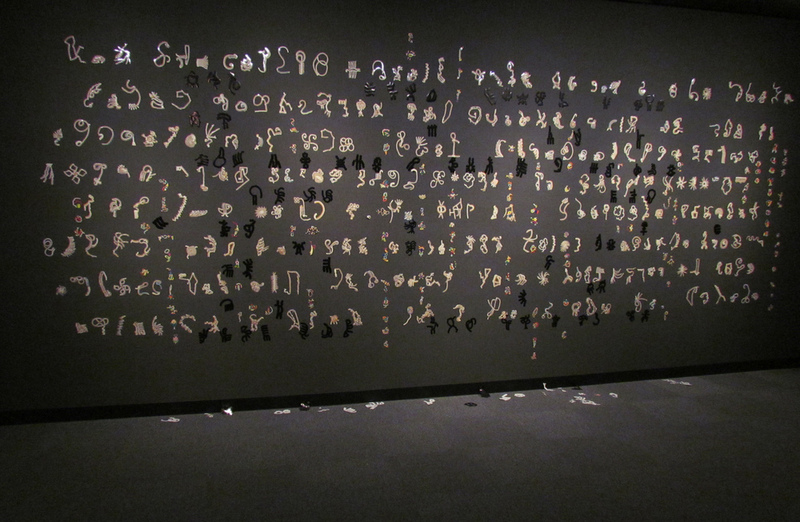 For this exhibit, the "Seal museum" from the previous "Seal Exhibition," where it was the central part of the exhibition, moved to the periphery, and the wall script, created using many piled seal stickers, became the centerpiece. For the seal museum, I exhibited the previously shown collections and created a replica of a parchment document which was surrounded by a large number of appended seals. I also developed the seal museum's more esoteric seal collections, inspired by the Minoan and Mycenaean seals and the seals and script of the Indus Valley, which both echo the script-like seals arranged on the wall, as a palimpsest, a layering of several texts scraped off and re-used for writing over time. The script-like units on the wall each are composed of the same number of stickers that are found on one sheet of that particular type. There are three types which have been displayed as the "Seal Palimpsest." 2014. Dimensions variable, over 500 units combined to create the layered wall script.